The problem at its core is demographic. Retiring baby boomers are paying off debt, not borrowing more. As time goes by, they willl increasingly become consumers of government largesse, as Greenspan points out, rather than its suppliers. The Millennials and GenXers are struggling with student debt, low incomes and paltry savings. For them, owning a home, the traditional means to stimulating overall demand, is more a future consideration than anything imminent. (In 1960 62% of 18 to 34-year-olds lived in their own households. By 2015, that number had dropped to just under 32%.) 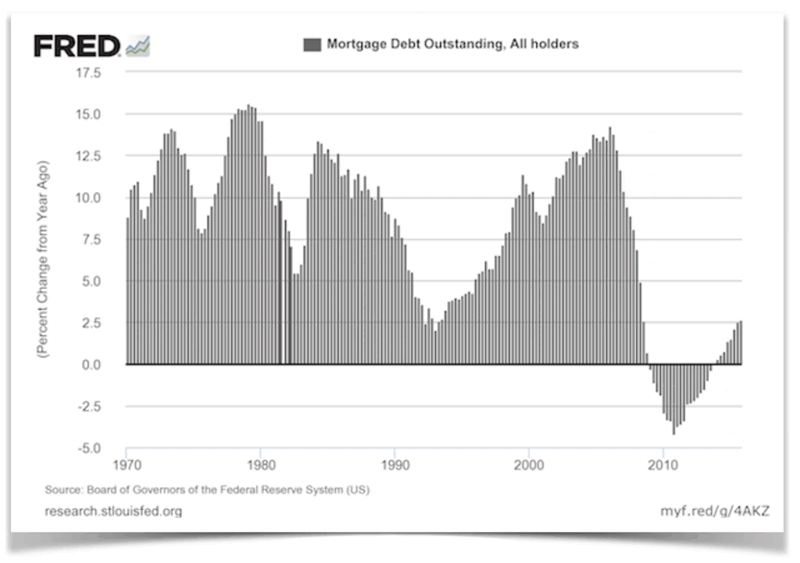 Outstanding mortgage debt, as a result of these demographic shifts, has gone into a free-fall. (See chart immediately below.) Simply put, the problem for the global economy, as King’s successor Mark Carney recently pointed out, boils down to the lack of demand – for goods and services and for money itself in the form of credit. Reader note: This article is reprinted from the June, 2016 issue of USAGOLD’s NEWS & VIEWS. For open access to the rest of this month’s issue, we invite you to register here. In addition, you will also receive e-mail notification when future issues are published. Free subscription. Over 20,000 subscribe to this widely-read newsletter. King’s use of the word alchemy in connection with central banks’ policies conjures all sorts of allusions. As we all know, the purpose of alchemy was to transform base metals to gold. Likewise, the contemporary central bank is alchemic in nature in that it professes to replace gold-backed money with sound and effective monetary policies. Those who believe that the central banks are capable of delivering consistently on that promise are not likely to become gold owners. Those who question it will continue to own gold and silver in their investment portfolios as a countermeasure, and in fact add to those holdings as circumstances require. It is quite clear that the former Fed chairman and the former governor of the Bank of England are in agreement that the global economy is tacking against some heavy headwinds. The demographic shift Greenspan cites and King’s admission of policy-makers failure in dealing with it point to continuing long-term demand for gold and silver not just among private investors, but among funds, institutions and central banks as well. In addition, it is the failures (or potential for failure) in policy, as cited by both King and Greenspan, that will give pause even to those who most ardently profess undying faith in the central banks. Along these lines, it is interesting to note that Greenspan has already suggested gold as “a good place to put money these days given the policies of governments.” Mervyn King may not be far behind. Post publication editor’s note (6-7-2016): No sooner had the ink dried on the June issue of our newsletter (of which this article was a part) than Mervyn King was quoted in the World Gold Council’s Gold Investor magazine as advocating gold ownership at a time of what he calls “radical uncertainty.” Some might think that we had an inside track on the World Gold Council interview released this morning, but we did not. Though we have a relationship with the World Gold Council that goes back decades, it does not send us advance copies of its publications. The similarities between King’s views and those of his old friend, Mr. Greenspan, were striking thus the conclusion that logically the former BoE governor might be headed in gold’s direction. “And I am very struck by the fact that over many many years, central banks, governments and individuals have always, despite the protestations of economists, held some gold in their portfolio. Obviously, there is no high running return, but when unexpected things happen, particularly when governments rise and fall, then gold is a means of payment that everyone is always prepared to accept. And I think that’s why even central banks have always had a role in their portfolios for gold,” he adds. I might add that the very same logic applies to gold as part of the private investment portfolio. For the full article, which includes some of Mr. King’s prescriptions for the global economy, we recommend the World Gold Council’s Gold Investor magazine. There you will find more good reading on current happenings in the gold market. 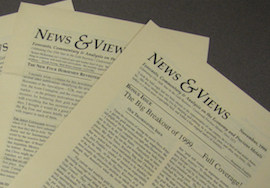 Reader note: You just read the lead article for the June, 2016 issue of USAGOLD’s NEWS & VIEWS. For open access to the rest of this month’s issue, we invite you to register at the link below. You will also receive e-mail notification when future issues are published. Free subscriptions. Over 20,000 subscribe to this newsletter . . . Please register here. June issue: What’s behind gold’s recent sell-off? What is the real reason why central banks can’t get the economy moving and what does it for future gold demand? Is there a major run on London’s massive gold vaults and where did all the gold go? What do 17th century Dutch tulip bulbs have to do with your portfolio today (the nature of financial mania)? And more.